If you install the desktop edition of WebSite-Watcher, it's only possible to run one instance of WebSite-Watcher. 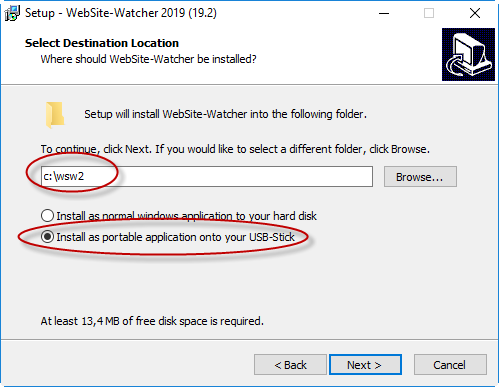 If you want to run a second instance of Website-Watcher on the same PC, you have to install a second copy of WebSite-Watcher as Portable Edition into a separate folder on your hard disk (eg. c:\wsw2). Then this second installation can be started and executed at the same time as the desktop edition. For each further instance you have to install a separate portable edition to your hard disk. The option for the "Portable Edition" can be selected during installation in the setup wizard. You don't need an additional license key when installing additional copies of WebSite-Watcher, just enter the same license key that you have used for your desktop edition.